The comment section is a crucial component of a blog; it is the place where the readers can interact with the content of a post and with other people in the community. The comment section differentiates a blog from a journal entry; it creates a conversation instead of a confessional. It also encourages democratic expression; in other words, it values not only the writer’s comments but also the reader’s. Bloggers, this guide will assess the influence that you can have over the comment section of your blog and the implications of your contribution to this element of your page. 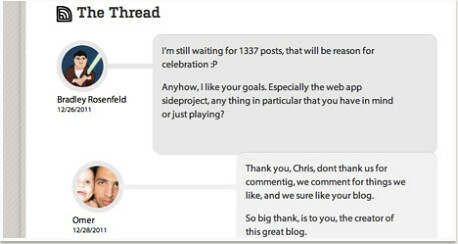 Blog comments tend to be praise, questions about, or general comments on the original blog post; they may refer to something said in the post, a photograph, or generally to the website as a whole. They are usually conversational, similar to forum posts, and visible to all readers. Blog comments can also be negative; there is a community of "trolls" or negative commentators on many websites, and these negative comments can often be a source of discord between bloggers. 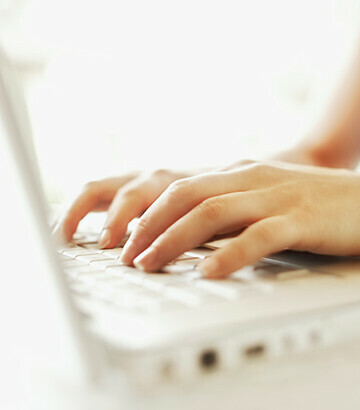 Negative comments are generally increased if the user can comment anonymously. The use of negative comments can detract from the sense of community experienced by users of blogs. Therefore, blog authors, avoid enabling anonymous commenting on your blogs; this can help maintain a healthy environment and healthy communication between users. This public sharing in the comment section serves a different purpose than an individual message to the blogger. For example, if one user asks a question that other users want the answer to as well, they may see the response in the comment section. It is more effective than email in this way. It also contributes to the creation of a secure community. When people share personal information in a public sphere, a prospective commenter will see that the community is one of support and acceptance. Since all comments are shown, and if none are anonymous, everyone is held accountable for their words. How do these communities differ? Though a comment section generally establishes a type of community within the readership, the environments created are diverse. Sometimes the author of the original blog post will participate in the conversation by responding to questions and comments. This type of interaction with the users is important. Bloggers, this will make you seem more invested in your readers and thereby help you build a stronger fan-base. Another possibility is to respond to readers' comments in a later post. This does not however create the same connection with the reader as responding directly does. Three examples of successful food blogs are 101Cookbooks, Smitten Kitchen, and Lottie and Doof. The authors Heidi Swanson1, Deb Perelman2, and Tim Mazurek3 all respond directly to their readers. These authors have received a lot of recognition for their blogs; they have been featured in renowned magazines such as Bon Appetit and Saveur and have won awards for Best Food Blog and Best Food Photography from sources like Time Magazine and Forbes. "Aw Peg! I hope you're feeling better. It will be great to get back in the kitchen and eating delicious food. Speedy recovery!" This is an intimate, caring reply to a member of his audience. This will also be viewed by other users and show them that they can count on security and support in the community of this comment section. Tim's willingness to go this extra mile contributes to his popularity in the food-blog community. For more discussion on different audiences, check out Internet Fandom for Dummies-Audience. As a blogger, you have a choice about how to appear in this environment. On the LottieandDoof.com, for example, blogger Tim sets his comments apart from the others with a yellow highlighted and bolded name. 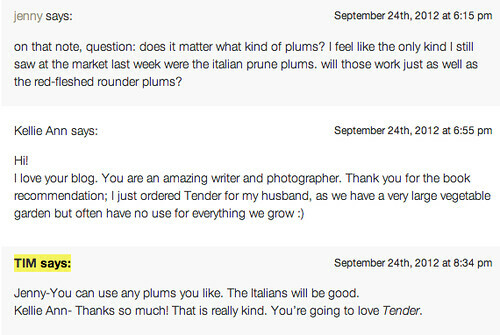 Both Heidi Swanson from 101Cookbooks and Deb from Smitten Kitchen sets their comments apart with a shaded background. This visual distinction makes it clear whom the original authors are, showing their participation but also superior authorship. Bloggers, examine the diction of your commenters; this is key to evaluating the kind of community that you are helping create. In response to blogger Deb Perelman’s post “crackly banana bread” on Smitten Kitchen, commenters use expressive words such as “yummy” and “amazing!” This community is not concerned with reservation or professionalism; the emphatic diction in each comment does not suggest a need for self-composure. The verb “love” occurs at least ninety times. From “I love millet” to “I love your blog,” the commenters are not wary of politesse. Instead, genuine enthusiastic expression is valued. Once in a while bloggers will have to deal with reader critique. Depending on the type of environment that is created in the comment section, these critiques can be an opportunity to share and engage on possible improvements to the original blog. Commenter Maggie comments on Deb Perelman's recipe for "crackly banana bread" on the blog Smitten Kitchen. She starts out by complimenting the author on one of her other banana bread recipes: "I’d never dream that you need anything more than the Jacked-Up recipe! It’s the ONLY banana bread recipe I use…" (Perelman). This commenter begins by showing her appreciation for the blog and the author's recipe. She then says that despite this, she does modify the recipe: she "double[s] up on the vanilla and skip[s] the bourbon" (Perelman). This is a respectful critique of the author's original recipe. Deb does not respond to Maggie's comment but this modification does provide an opportunity for a blogger to show his or her humility. It would reflect well on him or her to respond to this critique saying "I'm glad that worked out!" or, in a different case, "That sounds good! I'd like to try that modification as well!" This would establish a community that is continually learning and improving. Bloggers keep the format of the comment section in mind; your responses influence your audience's perception of your integrity. Therefore, any responses to critiques, if you choose to do so, must be well thought out because they will reflect your values and what kind of community you wish to foster. 1. Mazurek, Tim. “My Favorite Plum.” Lottie and Doof. n.p., 23 Sept. 2012. Web. 27 Sept. 2012. 2. Perelman, Deb. “Crackly Banana Bread.” Smitten Kitchen. n.p., 28 Sept. 2012. Web. 29 Sept. 2012. 3. Swanson, Heidi. “Lemon Ripple Cheesecake Bars Recipe.” 101Cookbooks: A Recipe Journal. n.p., 21 Jan. 2004. Web. 27 Sept. 2012. 4. Swanson, Heidi. “Lemony Olive Oil Banana Bread Recipe.” 101Cookbooks: A Recipe Journal. n.p., 2 Nov. 2011. Web. 27 Sept. 2012. 1. In the comment section of her post "Lemon Ripple Cheesecake Bars Recipe," the author responds to Maggie and Manda's questions. 2. In the comment section of her post "crackly banana bread," the author responds to Cara, Sari, Linda, Erin, Dianapen, JenSCooks, and others' questions. 3. In the comment section of his post "My Favorite Plum," the author responds to Kate, Jenny, Kellie Ann, Arielle, Sarah, Jill, and others' questions and comments.